China’s experimental one-kilometer solar panel road had been temporarily shut down after someone stole a small piece of it less than a week after it opened. 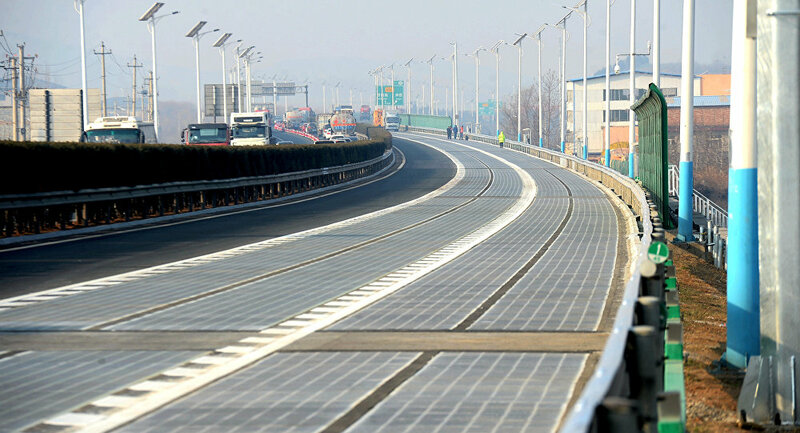 The world's first solar panel paved highway opened to use in China's eastern Shandong province on December 28 last year. It is covered in more than 10,000 solar panels and its three layers include translucent concrete on the top, photovoltaic panels in the middle, and insulation on the bottom, according to China Central Television (CCTV). There are also electromagnetic induction coils that may in the future charge pure electric vehicles as they drive overhead, and the system can even warm up in order to melt snow and ice. But on January 2 a routine daily inspection found that a 15cm by 185cm section of the solar panel surface was missing, the Qilu Evening News reported, pointing out that according to all indications someone deliberately detached it, with damage to surrounding panels. — Boateng Duka Kofi (@DukaKofi) 3 января 2018 г. The segment has already been repaired, and an investigation into the theft is ongoing, but there is still no plausible explanation as to why someone would want to steal a small piece of a cheap solar panel that wouldn't even be enough for personal use. If sabotage was the goal, the culprits would have damaged a larger section. A road construction worker suggested that the theft was the work of a professional team that could have been interested in replicating the technology in order to offer a similar product for a lower price, taking into account that the practice is not uncommon in China. Nevertheless, the road has been reopened, and no panels have gone missing since the stolen ones have been replaced.